Obverse: Crowned coat of arms, R over gate to the left of shield denoting Segovia mintmark, pellet above and below. II vertical to the right of shield, denoting the value, with F assayer below with pellet above and below, Text around PHILIPPUS V D G, separated by four petal rosettes. Reverse: Greek cross with castles in the first and fourth quarter, lions in the second and third quarter all within octafoil. The castles and lions represent the regions of Castile and Leon. Text around HISPANIARUM REX 1721, separated by four petal rosettes. 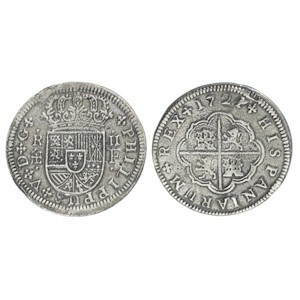 Date: Segovia mint, F assayer, 1721.